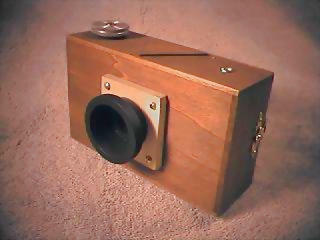 This camera uses standard 120 roll film. It is made from basswood with brass fittings. 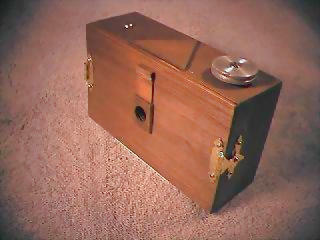 The film advance mechanism was salvaged from an old camera. The small triangle located at the top center of the camera housing is used for framing the shot. The pinhole is drilled through a .001 " piece of brass shim stock. The 'turret' is held in place with 4 screws and sandwiches the shim stock allowing for asy replacement and experimentation. Rear view with film counter window exposed. 120 roll film is paper-backed with the frame number visible through the frame counter window. This viewport is covered with a red filter. A sliding 'door' is used to cover the hole between shots to further protect the film from inadverent exposure. View with rear panel removed. The inside of the camera is painted with 'Darkroom' paint to prevent internal reflections. The internal 'shroud' prevents the fogging adjacent frames. 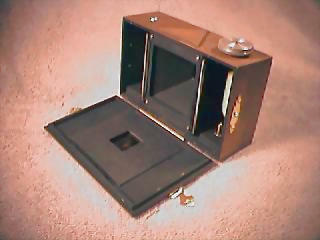 The pressure plate (mounted on the rear cover) is used to keep the film pressed securely against the shroud. 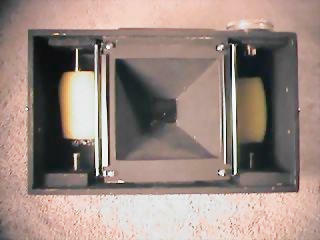 The film moves from the supply spool (left side of photo), over a pair of rollers to the take-up spool. The yellow objects in the above photo are soft foam (sponge-like) pads that help to keep tension on the film.